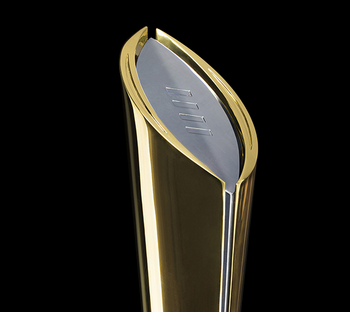 It’s championship week in college football, and the selection committee announces the four teams for the first college football playoff on Sunday. Will we see any upsets this weekend that alter the playoff landscape? 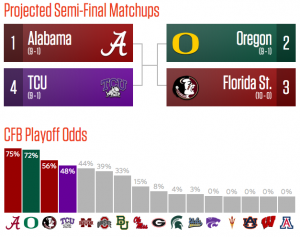 The numbers suggest we won’t see an upset with the top 3 teams (Alabama, Oregon and TCU). TCU doesn’t play in a championship game and hosts one of the weakest teams in their conference (Iowa State). 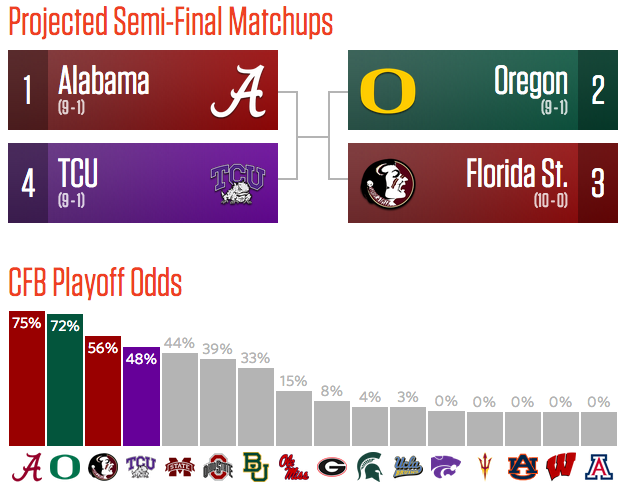 Their 92% probability to make the playoff is higher than the chance for Alabama and Oregon. However, we might see upsets for the next three teams: Florida State, Ohio State and Baylor. My calculations give a 81% chance that at least one of these teams loses this weekend. These predictions come from an ensemble calculation that aggregates many different predictors. The predictions based on team rankings are only one factor in the ensemble. The offense and defense rankings mentioned below are based on yards per play adjusted for strength of schedule. All predictions and rankings are available to members. I understand Arizona has won the last two games against Oregon. And it’s easy to just look at head to head games and think Arizona should win again. However, you shouldn’t emphasize head to head too much. There is variance in sports. Teams don’t always play at the same level every game. A better team can lose to a worse team. Sports would be much less fun if this didn’t happen. Arizona capitalized on a +3 turnover margin against Oregon in 2013. This season, Oregon tackle Jake Fisher didn’t play against Arizona, and the pass rush affected QB Marcus Mariota. The past will not matter once these two teams kick off the Pac-12 championship game. Expect Oregon to win. Missouri has the 5th ranked defense, and their offense moves higher each week in my rankings (currently 59th). However, they will struggle against the best team in the nation. These numbers do not capture motivation. I think TCU has motivation to win big to ensure that committee keeps them in the top 4. Expect a lot of points in this game, as Florida State and Georgia Tech have the 34th and 73rd ranked defense by yards per play adjusted for strength of schedule. This prediction has been adjusted by 4 points for the injury to Ohio State QB JT Barrett. Ohio State also has issues on defense as their 50th ranked rush defense faces Wisconsin’s top ranked rush offense. Baylor QB Bryce Petty will play against Kansas State after suffering concussion symptoms last week. While Baylor’s offense will find it difficult against Kansas State’s 13th ranked defense, they should win. The divisions of Mountain West conference are as lopsided as Eastern and Western conference of the NBA. The 3 best teams (Boise State, Colorado State, Utah State) play in the Mountain Division. West Division champion Fresno State, ranked 85th in my team rankings, has a 12.8% chance to beat Boise State. Which teams will make the college football playoff? How certain are we about these probabilities? Each week at Bleacher Report, I publish my playoff probabilities and write about the story behind the numbers. Last week, the article had over 159,000 visits and 459 comments. This week, we explore the following story lines around the college football playoff. How did Mississippi State’s odd increase after losing to Alabama? What is the probability that a two loss team makes the playoff? Can Ohio State climb from obscurity into the top 4 by season’s end? 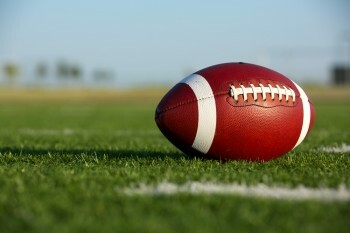 We evaluate their prospects in the Big Ten championship game. To play with the visual and read the article, click here. Armen Williams and Levack from 104.5 The Team (ESPN Radio in Albany, NY) interviewed me yesterday. We talk about college football, the playoff and all the big games for week 12 of the 2014 season. It was a blast. On some interviews, I only talk with the hosts during the interview. Even though they were running late, Armen and Levack took time to chat with me before the interview. And no one else has asked me whether I could beat Andrew Luck at Jeopardy. You can also listen to the interview on Youtube.